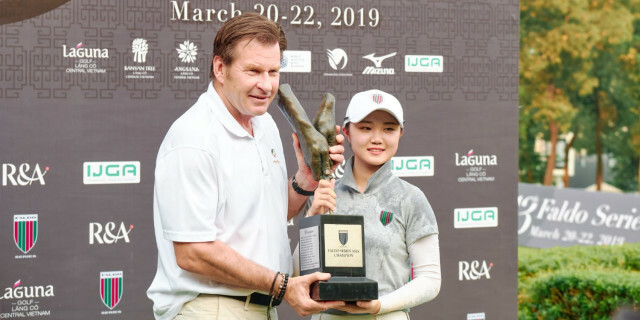 Talented female teenager Chang Hsin-chiao secured a memorable triumph at the 13th Faldo Series Asia Grand Final after overcoming a male opponent in a dramatic playoff with the legendary six-time major champion, Sir Nick Faldo, watching on. Hands shaking, Chang coaxed home a four-foot birdie putt at the second hole of a tension-packed sudden-death play-off to claim the most notable victory of what many are predicting will be a glittering golfing career. In the process she denied her compatriot Chen Ting-yu an historic double. "I was so nervous," admitted the 16-year-old who was doused in water and had a large bucket of ice poured over her by members of the Chinese Taipei contingent as she departed the 18th green. 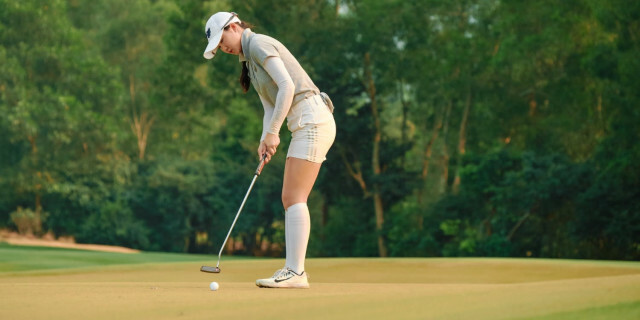 It was the second successive triumph for a female in the Faldo Series Asia Grand Final, following the success of Japan's Suzuka Yamaguchi in 2018. Given that it was achieved after an epic head-to-head duel with one of the region's leading male amateurs made Chang's triumph all the more remarkable. Tournament host Sir Nick Faldo, who watched the championship's climax intently from inside the ropes and presented Chang with the trophy, said: "What an exciting finish and what an outstanding performance from Hsin-chiao. There can't be many amateur sports where you have a boy and girl facing off like that on equal terms. I think it's fantastic that golf is able to do that." Chang, who is based in Korea where she is undergoing a strict golf training programme, began the day two shots behind pace-setting Chen in third place. Maintaining a methodical and meticulous pre-shot routine throughout, she was a model of consistency. In tricky conditions, with the wind swirling mischievously and the greens running at 11 on the Stimpmeter, Chang carded three birdies against two bogeys for a closing one-under-par 70. The only player to break par all three days in the 72-strong field which included representatives from 19 nations and winners from the 22nd Faldo Series Europe Grand Final and the second Faldo Series United States Grand Final, Chang posted a 54-hole total of five-under 208. That score was matched by left-handed Chen, who was bidding to become the first male from his country to claim overall honours in the Faldo Series Asia Grand Final and also write his name into the record books as the first player to hold the Faldo Series Europe and Asia Grand Final titles simultaneously. When he birdied the 17th to regain a one-shot advantage, the win seemed within his reach. However, an uncharacteristically wild three-wood approach to the par-five 18th found trouble to the left. Rather than try to hack out from shrubbery, Chen opted to take a penalty drop but was still only able to propel the ball forward 20 yards with a restricted backswing from a sandy lie. From 30 yards left of the green, Chen then produced the deftest of pitches to within 12 feet of the flag and holed the breaking putt for a battling bogey-six to take the contest to extra-time. Returning to the 18th for the play-off, Chen once more had victory in sight after a precise wedge approach left him a seven-footer for birdie. But a tentative stroke saw the ball miss on the low side and offer a reprieve to Chang, who duly grasped the opportunity at the next time of asking. Unlike Chang, Chen struggled for consistency off the tee, numerous wayward drives contributing to six bogeys in his one-over 72. Nonetheless, Chen, who handled himself with great dignity all week, was magnanimous in defeat. "She (Chang) drove the ball very well and straight. She made very few mistakes." Indian Keshav Mishra, second overnight, dropped out of contention after an eight at the par-four fourth but had the satisfaction of winning the Boys' Under-21 category, while Genki Otani's closing 66 propelled the Japanese to top spot in the Boys' Under-16 segment. Completing an excellent week for Chinese Taipei, Chen Ling-jie won the Girls' Under-21s by one stroke from England's Emily Brennan. Also celebrating was Korean Kang Da-yun, who had a hole-in-one at the par-three fifth. Faldo, who staged a number of clinics for participants and local school children during the week, said: "This week we brought together more than 70 talented young golfers from around the world. I was impressed with the standard of play and I'm excited about the future as we continue our efforts to grow the game of golf globally through the Faldo Series." "My thanks also go to our sponsors, The R&A, European Tour, Asian Tour, PGA Tour and the PGA of America who all support us every day to grow the game of golf around the world." Calver said: "What an exhilarating week, with perfect weather and course conditions to match. After last year's historic first female champion, who could have imagined an even more historic and exciting final round, going to a play-off? "Having the players experience several of our Phase Two upgrades to the golf course really showcased the playing strategy Sir Nick envisioned. The new island rice paddy tee on the fourth hole was well received and we look forward to introducing some unique new features for the 2020 Asia Grand Final." As well as two events in China and Thailand, championships have been staged in Australia, Bangladesh, Chinese-Taipei, Hong Kong, India, Japan, Nepal, Pakistan, the Philippines, Singapore and Vietnam over the past 12 months. Today, 40 Faldo Series tournaments take place in 30-plus countries worldwide, touching more than 7,000 golfers each year. Past champions include Tseng Ya-ni and Rory McIlroy, both multiple Major winners, while Thidapa Suwannapura (2010 Faldo Series Asia Grand Final Girls' champion) and Nasa Hataoka (2016 Faldo Series Asia Grand Final Girls' champion) both won on last year's LPGA Tour. Boys' Under-21: 211 – Keshav Mishra (India) 69-68-74. 217 – Yuta Kamiya (Japan) 70-75-72. 218 – Bryce Pickin (Australia) 78-74-66. 220 – Paul Murphy (Ireland) 75-70-75. Boys' Under-18: 208 – Chen Ting-yu (Chinese Taipei) 65-71-72. 213 – Petr Hruby (Czech Republic) 71-73-69. 214 – Kotaro Murata (Japan) 70-72-72; Mako Shapiyate (Chinese Taipei) 74-68-72. Boys' Under-16: 215 – Genki Otani (Japan) 79-70-66. 218 – Willy Chen (Chinese Taipei) 77-70-71; Weerawish Narkprachar (Thailand) 74-71-73. 219 – Wang Ngai Shen (China) 80-69-70. Girls' Under-21: 211 – Chen Ling-jie (Chinese Taipei) 71-69-71. 212 – Emily Brennan (England) 74-69-69. 215 – Anne Yu (China) 72-73-70; Chou Yi-ting (Chinese Taipei) 71-74-70. Girls' Under-16: 208 – Chang Hsin-chiao (Chinese Taipei) 68-70-70. 210 – Kan Bunabodee (Thailand) 71-69-70. 215 – Yoko Tai (Singapore) 69-71-75.